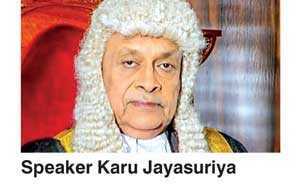 A defiant Speaker Karu Jayasuriya ruled yesterday that the opportunity should be allowed for a floor test when Parliament meets on 14 November,to prove who commands the support of the majority in the House. His decision was made amidst strong opposition from the UPFA group that attended a party leaders meeting with the Speaker last afternoon. In a statement released by the Speaker’s Office after the meeting ended inconclusively, the Speaker said he was acting in keeping with the request of the majority of members in the House, who have made a written request from him to allow for a vote. “The opportunity should be provided to show that the required majority to form a stable Government is there, after suspending Standing Orders at the end of the Business of the House set out for November 14,” the statement said. It said that Speaker Jayasuriya had taken the decision having listened to all sides represented at today›s meeting. “The Speaker said that 116 MPs had previously handed him a written request to allow for a vote in Parliament as soon as possible, and that he was abiding by the request of the majority,” the statement said. The unofficial party leaders meeting was heldto decide the agenda for 14 November, during which the UPFA had insisted that after the proclamation made byPresident Maithripala Sirisena summoning Parliament is read out by the Secretary General of Parliament, the House shouldbe adjourned. The UNP-led group, which included the TNA and the JVP, had however insisted that after the end of the day’s business, a vote must be taken to prove who commands the majority in the House. In announcing his decision, the Speaker has opined that the instability in the country, as well as the adverse impact the present crisis is having on the economy, as reflected in the stock market and other areas, can be overcome and the country’s image restored once such a vote is taken. Meanwhile Parliament sources said that more than 30 MPs had attended the meeting which was only meant for Party Leaders, with both sides set on persisting with different agendas. The meeting was attended by both MP Lakshman Kiriella, who claims to be the legitimate Leader of the House, as well as MP Dinesh Gunawardena, who claims he now holds the position after the October 26 sacking of Prime Minister Ranil Wickremesinghe and his Government.